I’m back with another AWESOME Captain Morgan Rum recipe! Last week I shared with you my Hot Choc-Colada recipe and asked for you to submit ideas to me about stress free holiday entertaining (as well as rum recipes)! Thank you to everyone who emailed me tips and recipes!! You all are creative, boozy entertainers! Guess who else has some tips for entertaining? Then we said our goodbyes. I know he didn’t want to go at this point, but I understood. He’s got my number. 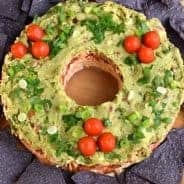 So I have tried several recipes out ahead of time for my upcoming party! I’m afraid to try recipes the day of an event. I’m not brave like that! Plus, it gives me an idea of how much time things take to cook and prepare! When it comes to simplifying for the holidays, I’m all about planning ahead. 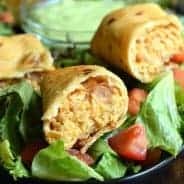 I make my list of recipes, and try to make as much in advance as possible! That way, when it’s the day of the event, I can focus on the fun, extra special touches, like decorations (and getting rid of the dog smell in my house)! For my upcoming Captain Morgan party I have decided to go with a Tropical Christmas theme. There is nothing more I enjoy than laying on a beach drinking a pina colada in the warm sunshine! But here in Ohio, in the middle of winter, there is nothing warm or tropical about our weather! 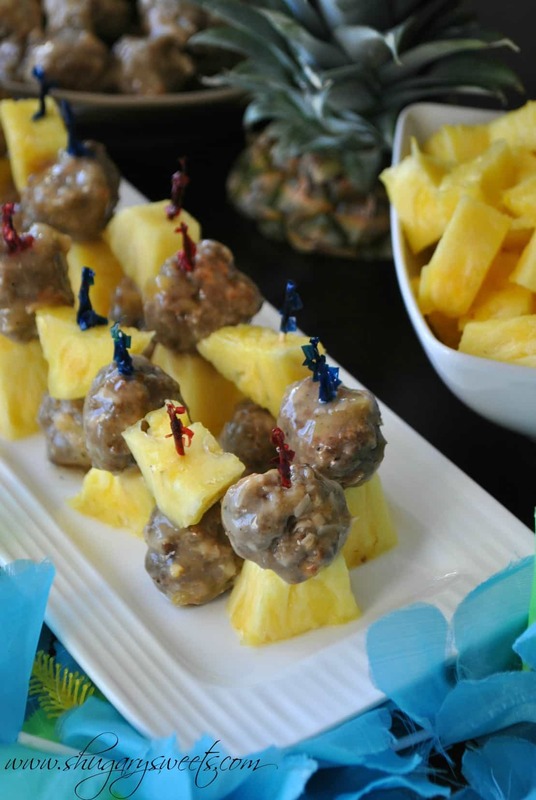 So I am creating some warmth by bringing in the flavor of the tropics to my holiday party! Do you have some great tips for creating a stress free holiday? Here are a few of mine, leave a comment with some more of your great ideas! Plan ahead. Make your menu, complete with shopping list, well ahead of time! If there is something you can make before the actual party, do it! Don’t go overboard on food. This is one thing I am still learning, but sometimes a simple menu is better. One that doesn’t have 10 appetizer choices. I’m not one to over decorate for an event, so keep it simple! A few decorations to match your party theme is enough! No need to go crazy. For my Tropical Party using a fresh pineapple in the centerpiece goes a long way! Add a few flowers and people get the idea! Encourage people to serve themselves. Provide a drink station where your guests can mix and make their own drinks. I like to provide one “signature” drink! The Hot Choc-Colada from last week combines my love of pina coladas with a delicious hot chocolate! Warm drink + tropical. Perfect for this theme! 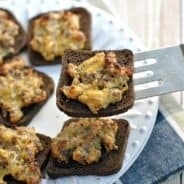 Today I’m sharing my appetizer recipe for the party. Rum Glazed Tropical Meatball Skewers! 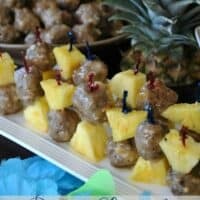 These tasty bite sized meatballs have toasted coconut and pineapple in the meatball, and are topped with a boozy tropical glaze! Plus, the meatballs can be made and baked ahead of time and frozen. Just heat up in oven and top with the hot Rum glaze before serving! ENJOY!!!! Next week I will be sharing my dessert recipe with you all (WHICH OF COURSE I’m super excited about, after all, this is Shugary Sweets)!! I will also share highlights of my Tropical Christmas Party!! And, if Spike and I talk again, (or if he shows up at my party…call me Spike, I will give you my address) I’ll share that with you all too!!! For the meatballs, preheat oven to 425 degrees. Line two baking sheets with foil. Set aside. In large mixing bowl, combine all meatball ingredients, using hands to combine completely. Roll into bite sized balls (I made about 60-70 meatballs, 1 1/2 inch). Lay meatballs one inch apart on foil lined pans and bake for 22-30 minutes, until completely cooked. Remove from oven. In the meantime, combine brown sugar, rum, lemon juice, worcestershire sauce, salt, cornstarch, water, garlic salt, red pepper, coconut milk and black pepper in a saucepan over medium heat. Use a whisk to combine completely and heat until sauce begins to thicken, about 5-8 minutes. Reduce to simmer and add crushed pineapple. Stir occasionally until heated. To serve, pour hot glaze over hot meatballs. Serve in a bowl with a container of toothpicks. 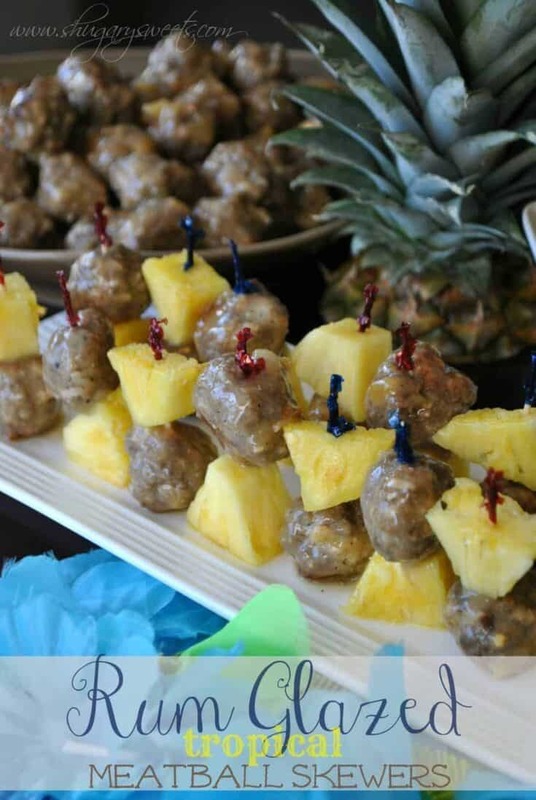 OR, for a special touch, skewer one meatball with one piece of fresh pineapple and place on a platter. ENJOY! Look, I sweaaaar I’m not “that” person, but can I come over when Spike comes over to your house and you two become new cooking BFFs? 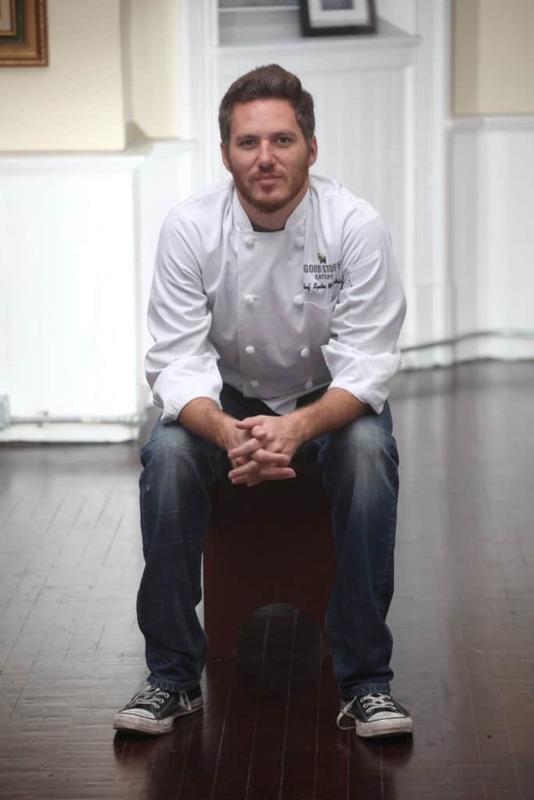 I swear I’ll bring some food and not any awkwardness now that you’re BFFs with a celebrity chef and all 🙂 that’s SOO awesome and I’m so happy you got to chat with him on the phone–eeeek!! 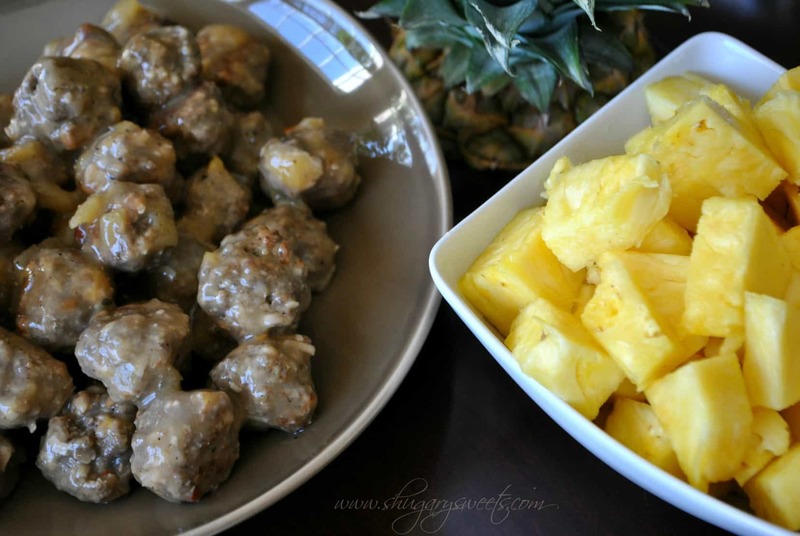 And these meatballs look like rummy, tropical goodness. I am loooving that there’s pineapple and toasted coconut (my fave!) inside the meatball. Wow. You can be “that” person. I’m totally okay with it! If Spike comes over to hang out, I’ll let ya know!!! the pineapple rum meatballes awesome. I love Spike! I’m so jealous he called you!! Buuuut I’ll look past it b/c those meatballs look amazing. You rock! How super cool, right?? Thanks for stopping by Meghan!! As a trial run, they definitely didn’t last long at all!!! What a delicious glaze! Sounds wonderful! Thanks so mcuh! It was quite delicious! Can’t wait to make it again! These look so delicious and sound amazing! Whoa, I am in love with this idea!! it’s a great hoilday app!! Thanks Cathy! They were so good I can’t wait to make them again! Even my non-coconut loving hubby devoured these meatballs! I was so laughing at your phone conversation (thanks!) 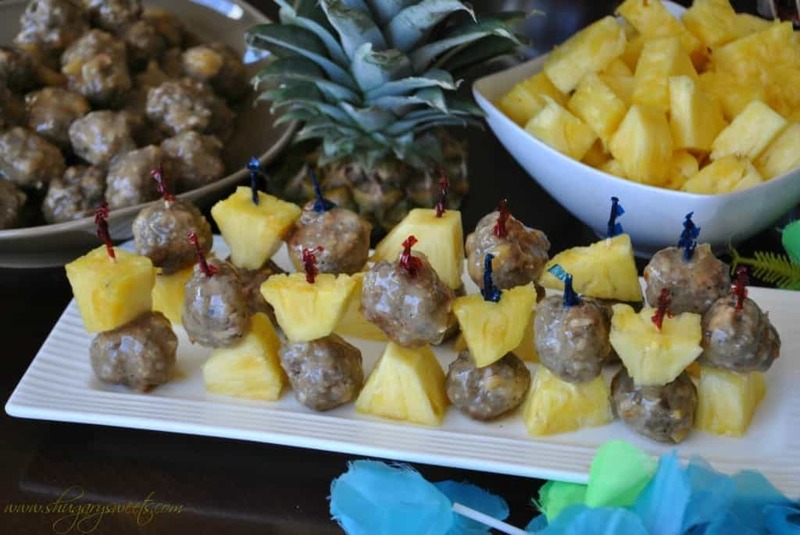 and your meatballs look so good, especially with the added coconut and then the rum glaze…..oh, my! These are perfect!!! I’ve been looking for a meatball appetizer that doesn’t utilize grape jelly, ick. So creative! I am so bad with simple! I usually way over do and am then exhausted. And I’m so way jealous that you talked to Spike!!!!!! I’m working on simple! I usually go simple on decorations, but then offer way too many food choices! Okay, number one: SO CRAZY COOL that Spike called you. Eeek. And number two: these meatballs need to be in my mouth right now. Seriously amazing. I totally agree! This is great fun and I love all the recipes that I am seeing so far- a great competition and a wonderful charity- whoever’s that is- will win! Perfect. And about that giggling? He was doing his fair share of giggling too- I mean really, chatting with 10 gorgeous women, who can cook! What’s not to love? Cant’ wait to see everyone’s Party posts. Thanks for stopping by Robin! Have a fun party, can’t wait to see the series finale next week! Luck you, I hope he shows up to your party. Those meatballs look so good, he shouldn’t miss out. I agree! Hear that Spike? (I know he secretly stalks me now)…come to my party! Holy creativeness! I want to come to the tropical party! Pretty please?!? It’s in 30 minutes, can you make it?? ?